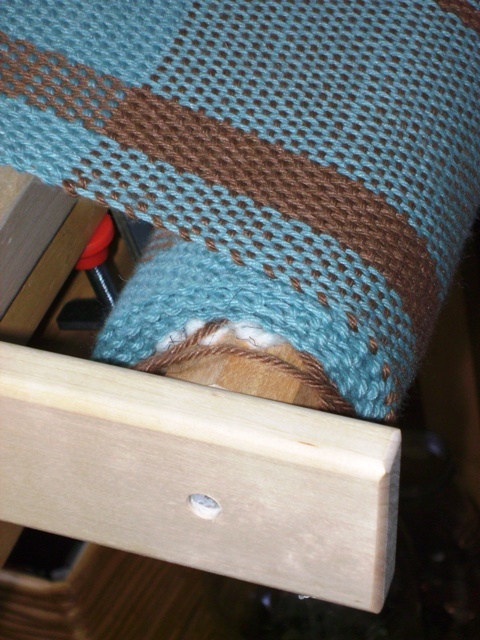 So, in a crazy fit of I-really-don't-like-this-at-all-REALLY, I cut off my clasped weft project and tossed it. If it was a knitting project, it would have been frogged, but seeing that it's a weaving project, all caught up in strands, it was tossed. It wasn't that I didn't want a clasped weft strap, it was more that I didn't like the colors, and the pattern wasn't to my liking. So, "snip." Thankfully, the yarn was very-nearly free, and the warp was extremely short, so there wasn't much waste. In other news, I'm happily waiting for "The Weaver's Idea Book: Creative Cloth on a Rigid Heddle Loom," by Jane Patrick. There's an awful lot of excitement about it on Ravelry, and some are saying it will rank alongside Betty Linn Davenport's classic, "Hands on Rigid Heddle Weaving." We'll see! I spent a few hours sewing the seams of my Doni's Deli bag. It's a little tricky, but I pinned it together and suddenly it all made sense. I decided to sew the handle edges together, but I'm uncertain about how it looks. I may tear out that seam and leave it. I had left enough fabric to create an inside pocket, but I also like letting it drape over the top. If I added a big button, it'd look pretty cute! What's left? Maybe re-doing the handle, maybe making a pocket/adding a button, maybe adding a liner. This is one big project! Here's the full fabric for my Doni's Deli bag, drying outside in the hot sun. I have a front-loading washing machine, and I was hesitant to wash this alpaca, wool, bamboo mixture, so I did it on the hand wash cycle. 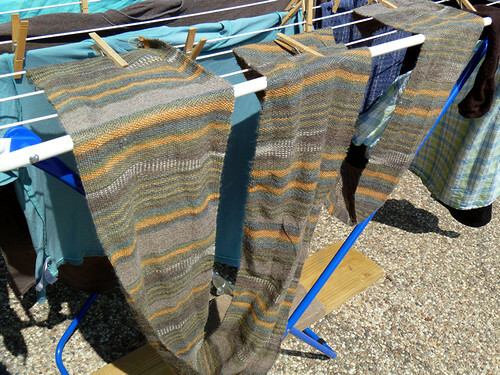 Some of the loopy selvedges did even out (as promised by the experts on Ravelry), but overall, the fabric was the same. So, I got brave and tossed into a regular load on warm. It came out exactly the same. So, although I didn't notice the words "Super Wash" on any of my yarn, it obviously doesn't want to felt. The good news is that I have a long enough piece to try to add a pocket to my bag. What's come over me? 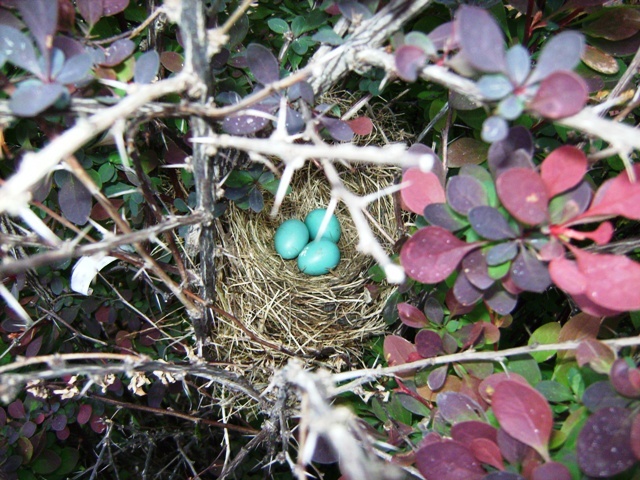 Bright green! Aqua! Tangerine! I'm normally a plain Jane with yarn color, but all of a sudden, I seem to want colorful, bright, cheerful yarn. The mohair may become a scarf–a very shrieking orange one. After reading a number of stories about the danger of using mohair as a warp, especially with a smaller dent heddle, I purchased that Cascade off-white cotton as the warp. The thin cotton crochet thread was a six pack. So far, it's turning into a groovy-looking, clasped-weft strap. It's been over two months since I warped my Emilia and started weaving the fabric for a bag like the one at Doni’s Deli. Why two months? Well, I made some beginner mistakes, which I don't have to list, but the main one was I chose sock yarn for both the warp and weft. With a 12 dent heddle I probably would have been okay, but I only have a 10 dent heddle, and it took a gazillion rows and hours (at least!) to finish the fabric, which measures 100". When I neared the end, I ran out of my main sock yarn and also my patience, so I dedicated the final few inches to experimenting with the clasped weft technique. If you're interested, there's a short tutorial available here, and lots of lovely examples posted on blogs. I wanted to try using some rags, so I found this pretty material in my closet, about a square yard, and I cut it into 1″ strips. I’m also weaving a row or two of the cotton thread just for variety. I think it’ll make a small mat of some kind, but it’s not very sturdy. 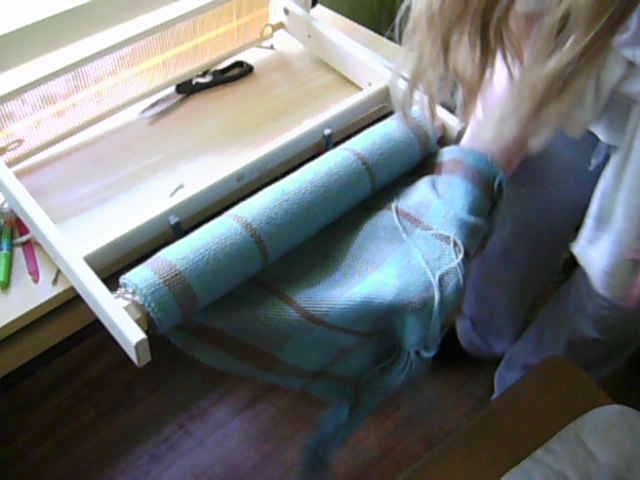 To really use rags on a rigid heddle loom, I’ve read you need to pack the rags with a fork instead of relying upon the heddle. We’ll see how it goes. 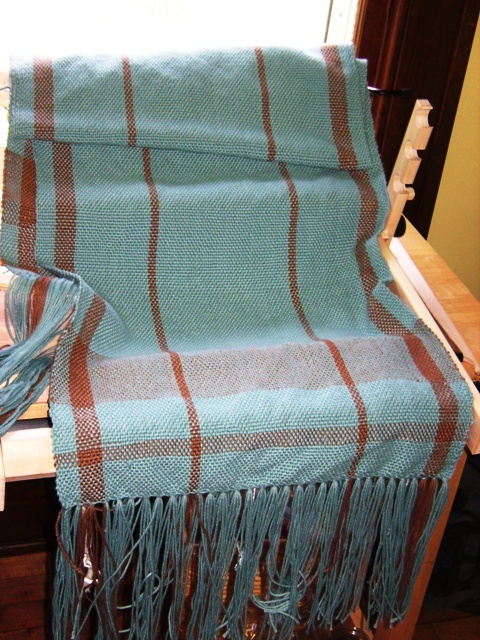 If I like how this looks, I may end up tearing up some more rags, warping the entire loom, and making a bathmat. What I’m not certain of is what I’ll keep weaving on this. 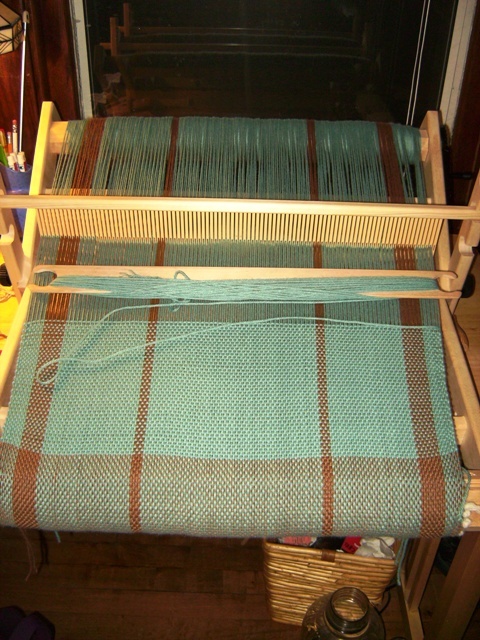 I assume this mat will bea about 8″ or so… that leaves me with a really long, narrow, staggered warp. Ummmm…. funny looking scarf, maybe? The FedEx delivery person was kind enough to leave my new loom safe in a plastic bag because it was raining yesterday. I was happy because the loom stayed dry. I was even more happy to realize the loom was already put together. For some reason, I thought I had to assemble it. The pictures aren't the greatest but they show the box, the loom in the box, the loom outside of the box, and then the fairly awful warping process. (Awful because I chose a linty cotton… I know, I know…) But I did warp about 6' of the cotton and even started to weave a little bit. It took me about 1.5 hours, from opening the box to warping to starting to weave. I know one thing. I LOVE my new loom. It's sturdy and strong. The metal ratchets and pawls are awesome. There is, however, a little mystery with this loom. I'll share that tomorrow, after I do some detective work. 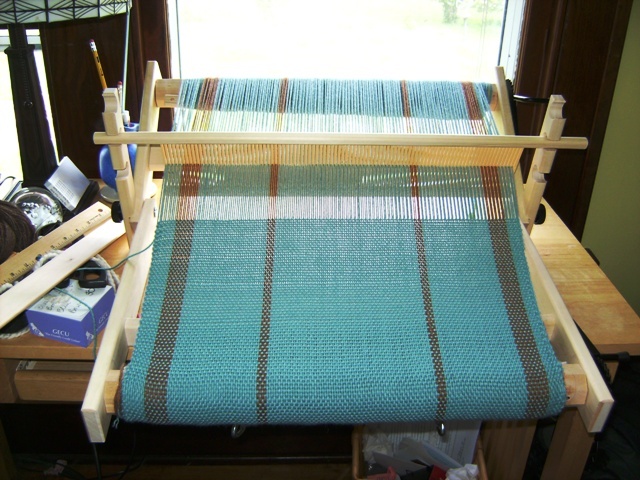 I'm watching the tracking on my new loom as it makes its way across the country: an 18" Glimakra Emilia rigid heddle. Whew! A lot of thought goes into selecting a loom, even a small one, so I'll spare the details other than saying the sturdiness and metal ratchets were appealing, along with the fact that it can fold.